photo by Michael ErmilioMembers of Tangle Movement Arts, an aerial dance and interdisciplinary performance company, know what it feels like to swing high above a captive audience. The all-woman troupe based in Philadelphia blends dance, theater and circus arts, and was founded in 2010 by Lauren Rile Smith. In 2011, Tangle created tinycircus—an eclectic, family-friendly showcase that features dancers twisting, hanging and gliding using ropes, trapeze and aerial silk. 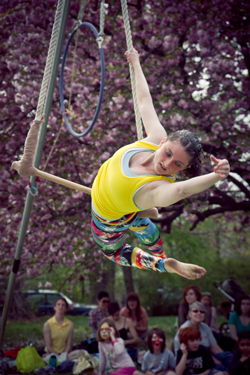 Most of the members of Tangle participate in tinycircus shows, and Smith says she also invites performers from a wider community of jugglers and hoop artists to join for specific shows. Tangle puts on two full-length shows each year, in addition to free, outdoor tinycircus performances, which have been a part of Go West! Craft Fest since the spring of 2012. “We love being part of the festival,” she says, adding that it allows the dancers to show off new movements. “It’s a chance for us to experiment and to share what we do with a wide range of people,” she says. “[It’s great to hear the] excited shrieks of a child when they see us upside down 20 feet in the air." To learn more about Tangle Movement Arts and tinycircus, visit tangle-arts.com.